Beyond the work of the organized GOP, there's concern that intimidating on-the-ground tactics from Trump supporters may also be keeping minorities from the polls. 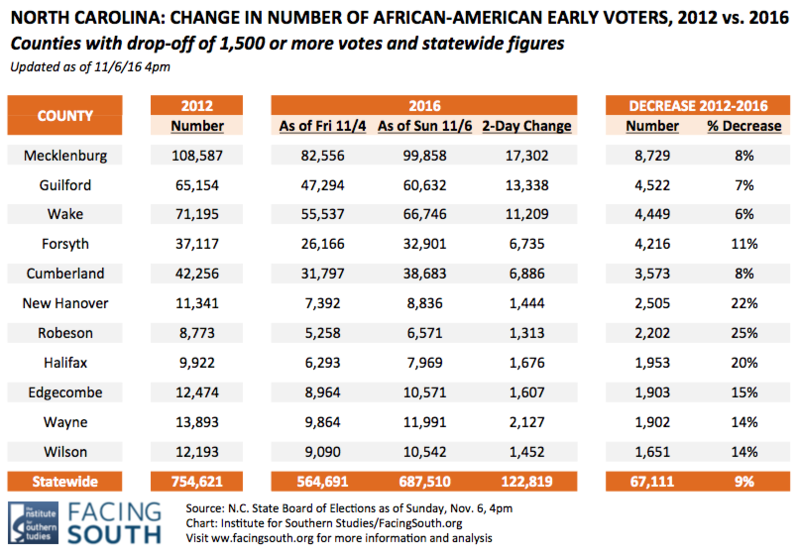 African-American turnout in the Tar Heel state through Saturday declined this year compared to 2012 by 8.7 percent, or around 66,000 votes — going from just under 754,000 votes to just over 688,000. That’s according to numbers released by Michael McDonald, a political science professor at the University of Florida and a leading expert on voting rates. “Something went very wrong for African-Americans’ voting in North Carolina,” tweeted McDonald Sunday. Some of the deficit could still be made up on Election Day. But if it isn't, it could cost Hillary Clinton and Democratic Senate candidate Deborah Ross in a pivotal state where minority voters are crucial to Democratic hopes. Could the decline simply be the result of lower enthusiasm among black voters this year compared to 2012, when President Obama was on the ballot? Perhaps, but McDonald’s numbers for other southern states that record racial voting data show no such decline. In Florida and Georgia, both presidential battlegrounds like North Carolina, black voting is up slightly. And in Louisiana, it’s up a whopping 18.5 percent. But in North Carolina, Republicans imposed restrictive new voting rules. In September, Dallas Woodhouse, the executive director of the state Republican Party, emailed county election boards urging them to restrict access to early voting in order to benefit the GOP. Because the state’s governor is a Republican, county election boards are GOP-controlled. “Our Republican Board members should feel empowered to make legal changes to early voting plans, that are supported by Republicans,” Woodhouse wrote. “Republicans can and should make party line changes to early voting." After a state board intervened, the total number of early voting hours in the state increased slightly from 2012. But several counties followed Woodhouse’s directive and reduced sites or hours, especially during the first week of the 17-day early voting period. State-wide, there are 27 fewer polling places than in 2012, a recent report by a leading civil rights group found. Three large counties — Mecklenburg, Guilford, and Forsyth — set restrictive first-week early voting schedules. (Guilford County went from having 16 early voting sites during that period in 2012 to just one this year.) Black voting was down by 8, 7, and 11 percent respectively in those counties, according to state numbers. The reduced number of sites led to reports of long wait times to vote in some places. 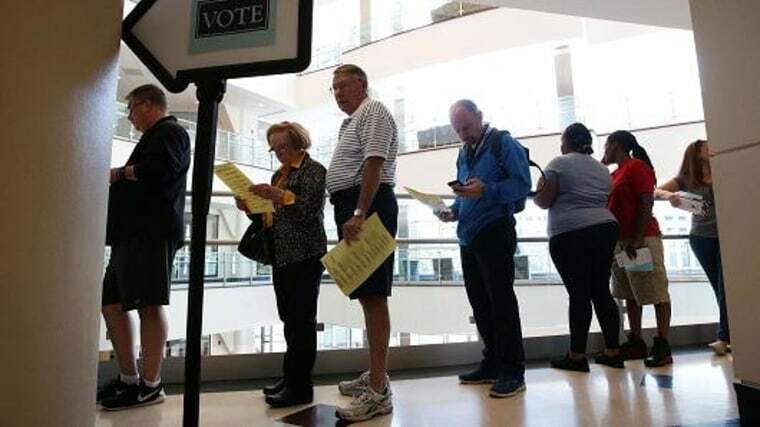 “During the first week, we were just getting tons of tons of calls to the hotline about long lines,” said Allison Riggs, a voting rights lawyer with the Durham-based Southern Coalition for Justice, who staffed an election protection hotline. Can Clinton pull off a North Carolina win? The state Republican Party sent out a press release Monday celebrating the decline in Democratic voting, including the numbers for African-Americans. “Obama Coalition Tired,” it said. A party spokeswoman didn’t immediately respond to a request for comment on whether the early voting cuts played a role in the lower black turnout numbers. Still, voting was down in counties that didn’t see cuts to early voting access, too, suggesting that the cuts aren’t the only relevant factor. Riggs said she believes the cuts played a large role, but she thinks that reports of intimidation by Donald Trump supporters may also have played in. “We had a bunch of people from Henderson County saying folks are out there driving around African-American neighborhoods yelling at people. People didn’t feel safe going out,” Riggs said, adding that some worried about losing their jobs. There have been other reports of intimidating behavior at the polls in North Carolina. An election worker in Lee County was seen carrying a baseball bat with “Trump” on it across the street from a polling site. And Riggs said a military vehicle with Trump signs was parked across the street from a Forsyth County voting site, intimidating some black voters. Trump has frequently encouraged his supporters to closely monitor voting in “certain areas,” falsely suggesting that the election could be stolen through voter fraud. Those calls have led to widespread concern about voter intimidation targeted at racial minorities. Two other factors that may have contributed to the voting drop-off: Some of the largest declines were in Cumberland and Robeson counties, both of which were hit hard by Hurricane Matthew. Some residents of the state's coastal areas are still getting back on their feet. And Republicans eliminated straight-ticket voting, a time-saving device which allows a voter to select a party's entire slate of candidates by hitting one button. Over half of all voters used straight-ticket voting in 2012, and it was especially popular with African-Americans. It's loss is likely to have caused longer wait time to vote. There was also a bid last month by three counties to remove thousands of disproportionately black voters from the rolls after citizens challenged their eligibility. A federal judge blocked that effort after the NAACP sued. Until 2013, 40 of North Carolina’s 100 counties were covered under the Voting Rights Act. That meant that even minor changes to election rules had to be pre-cleared by the U.S. Justice Department to ensure they didn’t harm African-Americans. In June of that year, the Supreme Court invalidated the pre-clearance system, making it easier for jurisdictions to impose restrictions.